Finally I can publish my newly created Silverlight Book 🙂 . This was first Created in Silverlight 4 Beta but because that is not public yet and if you do not have Silverlight 4 Runtime installed you will and up installing Silverlight 3 Runtime and than some components ware not compatible so I had to downgrade to SL3. The main purpose of this book is to host a news magazine but since that is not finally implemented I decided to publish this. When I first started to make the book control it was a very big challenge since they are a very few Silverlight book example even les than now. Now all major Silverlight Controls developer company has this control like Telerik and Devexpress also (but take a look at the prices !!! ). Of course the functionality is not as complex as theirs and was not my purpose to make a complex control. The main idea is to have that book flip effect and behavior. 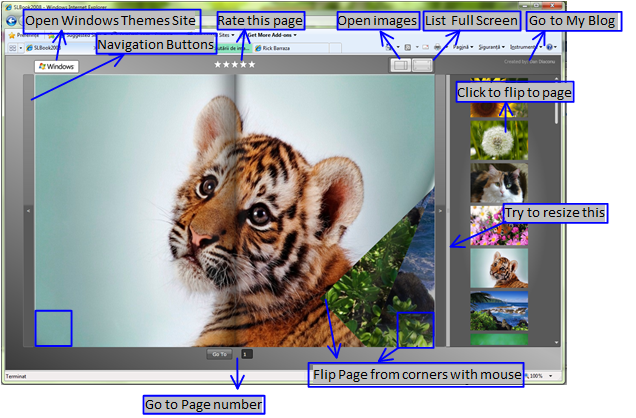 The Silverlight component is composed from a custom Silverlight book control, navigation buttons to turn page , an image panel that uses an Animated Panel List control to select and view images. Images are populated using a Web Service to provide a array of images Uri’s from the server folder, for the page backgrounds. The page also support any adder type of controls since this is Silverlight and in a Silverlight Canvas you can have adder controls. Here is not a controlled animation , is a canvas that uses complex masking and some geometry calculations to know the angles and positions function of the mouse position and so on … . I have to tell you that all this started from am example published by Rick Barraza . So if you want to make your own Silverlight Book start from Rick Barraza’s blog. Note: This is hosted on my personal home PC so is not online 24/7 , but most of the time is online. The images are taken from windows.microsoft.com site. So , you have to pages that you can flip with mouse or from keyboard using Left, Right, Up, Down , Home, End, Page Up, Page Down keys or you can insert the page number that you want to open in the Go To section. 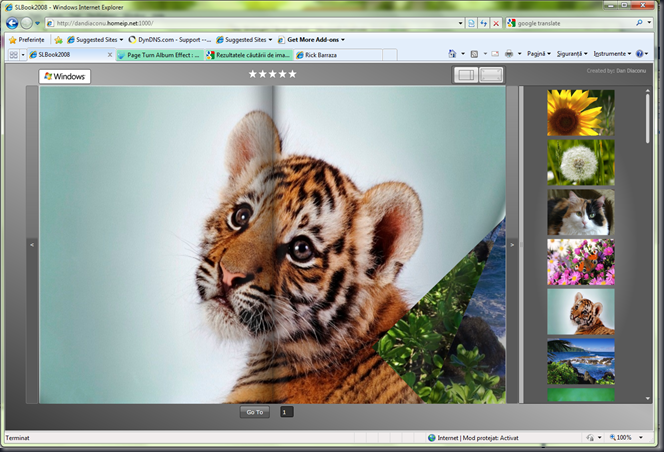 The Right images panel also allows you to navigate to the images you click on . On the top of the book are the List Button , Full Screen Button, the Blog link and the Windows image for the user to navigate to the original source of images since they are very beautiful images and you may want to use some as Desktop wallpaper. The Rating control also is a way for me to know if the Book is appreciated by visitors. Here I am trying to explain all this in images since is a more easy way to explain. Hope this is some how useful to you (if you are a Silverlight developer ) and that you enjoy this . This entry was posted on April 10, 2010, 6:24 pm and is filed under Computers and Internet. You can follow any responses to this entry through RSS 2.0. You can leave a response, or trackback from your own site. Hi,Could you please provide a link to the source code?Thanks! I a few day\’s I will give the if asked by mail (diaconu13@hotmail.com), but with the condition to tell me where it was used so I cand unseit as a reffrence.